Social media is often among the first places hiring managers will go when researching job applicants. LinkedIn is frequently used to identify potential candidates and contact them. Facebook and Twitter serve as simple personality background checks that employers can use to get a feel for a prospective hire’s character. This is why social media professionalism is essential to making a good impression on potential employers. Pursuing a master’s in social work degree can open up new job opportunities, but higher-level positions may come with more scrutiny and competition. This adds to the importance of a strong social media presence that helps hiring managers understand what they can expect when working with you. A report from The New Social Worker explained that social workers have historically used community groups, industry organizations, newsletters, and training sessions to connect with peers. These types of events allow professionals with similar interests to gather and get to know one another. While many of these venues are still viable for networking, it’s important to recognize that social media expands the reach for connections in the field. These kinds of efforts can lead to stronger relationships across the industry. To get these results, the New Social Worker recommends you take a highly strategic and focused approach to how you use social media. Basically, don’t try to pursue every possible social media opportunity. There’s too much to do to keep up with it all. Instead, focus on the avenues and interests that are most interesting to you and relevant to your goals. This can help you make the type of connections that get your foot in the door for a new job or advancement opportunity. However, it’s also essential to have a strong presence as you seek a job. 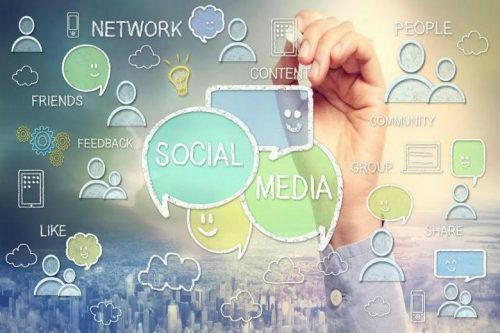 Approximately 70 percent of hiring managers responding to a CareerBuilder survey said they check social media when pursuing a hire. In addition, 57 percent of those polled said the content they’ve seen has caused them to not hire a candidate. This doesn’t mean you can’t have a fun and friendly approach to social media. Instead, it’s important to consider the way that different social media channels are used during the hiring process. Even if you have an unconventional job title, try to mix in fairly standard language describing what you do or the type of job role you would like. If you use unusual terms to define your job, your profile will be less likely to show up in searches. Employing the typical terms the industry uses to describe what you do means your profile may be more likely to come up when hiring managers search for certain job roles. Make sure your picture is a simple image that reflects you as a professional. You don’t want an overly personal photo to create a poor impression when somebody visits your profile. Join industry groups and comment on articles to get more deeply involved in the LinkedIn community and start building relationships. Treating LinkedIn as a living resume can help you make the most of your presence there, but it’s important to also consider the relationship-building opportunities available on the channel. Both Facebook and Twitter get a great deal of attention as mainstream social media channels, but they don’t offer many opportunities that are specific to building work connections. On Twitter, you can follow industry leaders and organizations, retweeting tweets that you find interesting to potentially connect. On Facebook, you can make more personal connections and provide professional connections with more perspective into who you are. Because these channels are more personal, they leave you with some freedom to express yourself in ways you might not on LinkedIn. However, you should be careful to avoid controversial topics, public posts about highly personal matters, or similar types of communication that can damage how somebody who doesn’t know you may perceive you. Your friends may be able to tell if you’re joking or expressing a serious opinion, but a hiring manager may not know you enough to be sure and could view what you see as a normal post as a red flag. You don’t have to maintain full professionalism on Facebook and Twitter, but you shouldn’t take chances. You may want to think of it as being at an office outing instead of in the office. You can be more relational and casual, but there are still boundaries. Social media is just part of how somebody may find out about you online. Hiring managers are increasingly taking advantage of artificial intelligence and deep searches to identify qualified candidates. A simple Google search can reveal a lot about you, bringing up any mentions of you online. In social work, where you’re involved in deeply personal interactions, your reputation becomes especially important. Carefully consider how you manage every aspect of your web presence to both optimize the opportunities you create online and avoid common pitfalls. Of course, having a strong social presence is only part of the issue. You also need a degree that helps you prepare for your career. Contact Regis College today to learn about how our online MSW program can help you gain the skills and professional development support you need to advance your career.